On March 31, the Mekong Delta province of Bac Lieu declared a level 2 emergency situation for drought and saline intrusion, which has plagued the province for months. The natural disaster has taken its toll on Bac Lieu since October last year and is expected to continue till the end of June. 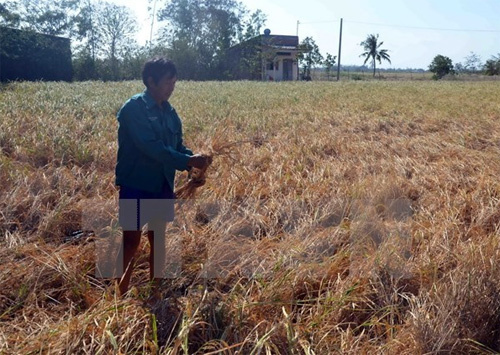 Nearly 14,000 hectares of rice fields have been damaged, at a cost of more than 150 billion VND (6.75 million USD). The provincial body in charge of agriculture forecasts 2,300 more hectares will be affected by water shortages, with over 500 hectares ruined completely. Water supply for local households is also running out. As of February’s end, Bac Lieu saw a reduction of two metres in the level of groundwater. Many of the province’s 101 water supply facilities have to work around the clock, and even then, residents still lack water during peak hours. Chairman of the provincial People’s Committee Duong Thanh Trung ordered localities and districts to calculate the damage and how much financial assistance will be needed. So disaster-hit families can soon receive aid and funds to continue their production. Local famers have also been warned not to plant early summer-autumn crops as adequate water for irrigation is not guaranteed./.